"My life's worth isn't your concern… Hasn't been for years." Finally! It has taken ages for this one to finally get a release, after all kinds of production problems and distribution delays. 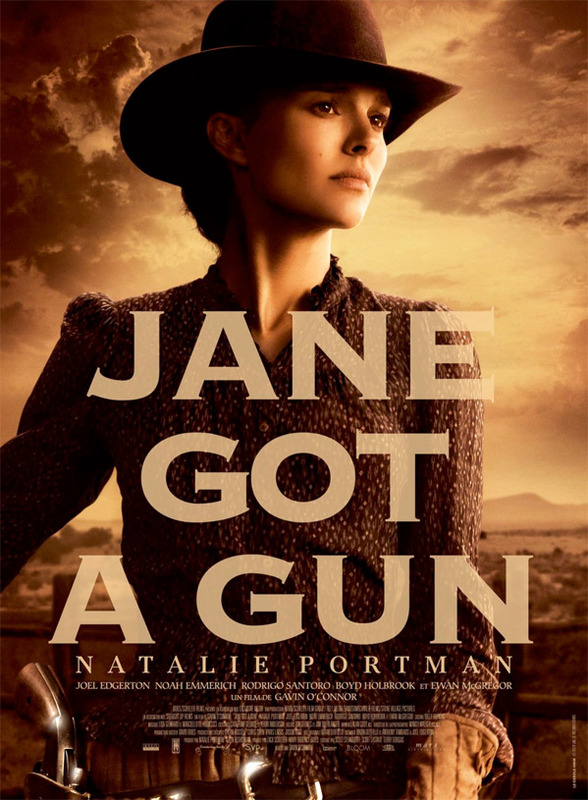 Mars Distribution out of France has unveiled a trailer for Gavin O'Connor's Jane Got a Gun, the western starring Natalie Portman as a woman who pursues revenge after a gang kidnaps her husband. The full cast includes Ewan McGregor, Rodrigo Santoro, Noah Emmerich and Boyd Holbrook, as well as a few others. This honestly doesn't seem as bad as I was expecting. It looks much more polished than I thought it would, and Portman isn't an angry, wild character as much as a crafty, calculating revenge-seeker. I'm still curious about this, perhaps. Jane Got a Gun is directed by Gavin O'Connor (Miracle, Pride & Glory, Warrior) and written by Brian Duffield (The Divergent Series: Insurgent). After her outlaw husband returns home shot with eight bullets and barely alive, Jane (Natalie Portman) reluctantly reaches out to an ex-lover (Joel Edgerton) to help her defend her farm when the time comes that her husband’s gang eventually tracks him down to finish the job. Noah Emmerich also stars in the film as Portman's pursued husband while Ewan McGregor plays the gang leader. Rodrigo Santoro and Boyd Holbrook also star in the film, which ran into numerous problems during production including the original director never showing up. The Weinstein Company is now planning to release O'Connor's Jane Got a Gun in February 2016, so stay tuned for updates if you're still interested. Looks just OK, it seems they showed a lot of the plot. I'll wait for it on Netflix. I thought the trailer was going to put me to sleep. and how "badass" can these outlaws be if ONE woman is going to bring them down?.....pass on this. i'm amazed it's made it to the screen at all after the journey it's had, but i love a Western with good actors, and i thought that looked OK. will definitely give it a shot. i really liked Warrior, so directed by O'Connor is a plus, even if he wasn't first in line for the gig, and i'll pretty much watch anything with Portman and Edgerton (both of whom came off well in the trailer) or McGregor - now with added 'tache and a passable accent! Just feels bleh. The soundtrack is straight up awful. Jane Unchained 😉 I feel like this should have been made by Tarantino... might have helped the soundtrack too. I love westerns. In fact it's one of my favorit generes. But this brings me nothing. Natalie Portman is to pretty. I want dirty men with dirty beards and gaunt looking women tired of giving birth. I want... Blood meridian.